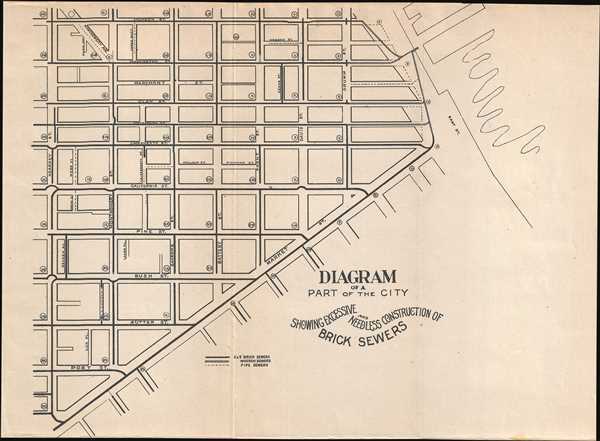 A map criticizing the construction of brick sewers in San Francisco's Financial District. Diagram of a Part of the City Showing Excessive and Needless Construction of Brick Sewers. This is an 1893 San Francisco Board of Supervisors map of the Financial District in San Francisco, California. The map depicts the city from Kearney Street to East Street and the wharves along San Francisco Bay and from Jackson Street to Market Street. Illustrating the sewer network in the neighborhood, the brick sewers, wooden sewers, and pipe sewers are each noted by a different symbol. Brick sewers dominate, with pipe sewers interspersed between them and wooden sewers connecting the entire system together under East Street and running into the bay. The title states that the construction of the brick sewers was 'excessive and needless.' This point is intriguing, because the Board of Supervisors, most likely, was the entity that OK'd the construction of brick sewers sometime before this report was filed. Evidently, for some reason, the Board of Supervisors had a change of heart. This map was published by order of the San Francisco Board of Supervisors in the 'San Francisco Municipal Reports, 1892-93' and printed by James H. Barry. San Francisco Board of Supervisors, San Francisco Municipal Reports, 1892-93 (San Francisco) 1893. Very good. Light wear along original fold lines. Blank on verso.